FREMONT, CA--(Marketwire - February 8, 2010) - 3PAR® (NYSE: PAR), the leading global provider of utility storage, announced today that the 3PAR InServ® F400 Storage Server -- one of the newest members of the 3PAR InServ family of storage servers -- has been named the disks and disk subsystems 2009 "Product of the Year" by Storage magazine-SearchStorage.com. The awards are presented by the editors of TechTarget's Storage Media Group and were judged by the Storage magazine-SearchStorage.com editorial staff in conjunction with a team of users, industry experts, analysts, and consultants. The 2009 awards included five categories: disks and disk subsystems, storage management tools, backup hardware, backup and disaster recovery software and services, and network equipment. Winners in each category were selected according to innovation, performance, ease of integration into existing environments, ease of use and manageability, functionality, and value. 3PAR launched its InServ F-Class arrays in April of 2009 to meet the demand for highly virtualized storage with the simplicity, efficiency, and ROI offered by 3PAR's InServ T-Class arrays at a price and configuration designed to fit midrange budgets. The F400 offers a leading-edge, Mesh-Active, quad-controller architecture and silicon-powered "fat-to-thin" conversion thanks to 3PAR's Thin Built In™ ASIC. The F400 is designed to exceed the rigorous demands of the virtual datacenter and the private cloud with high-end features such as 3PAR Persistent Cache, which maintains virtual machine performance even when major hardware components fail. The F400 is included in the Get Thin Guarantee, a new 3PAR program that guarantees capacity savings of at least 50% to qualifying customers converting from existing "fat" volumes on traditional storage to new thin volumes on any 3PAR InServ Storage Server with Thin Built In™. With the F400, 3PAR customers have been able to purchase up to 50% fewer arrays, buy up to 75% less power, capacity, and space, and reduce storage administration time by up to 90%. The F400 is also the highest-performing midrange Fibre Channel array available at the lowest total cost, as measured by audited, peer-reviewed SPC-1™ results on file with the Storage Performance Council (SPC). "Throughout the economic downturn we have seen increased adoption of our InServ F-Class arrays in response to tighter budgetary conditions and competitive pricing -- factors which have lead to a demand for storage that behaves like Tier 1, but comes with a Tier 2 price tag," said David Scott, President and Chief Executive Officer for 3PAR. "Being awarded the Product of the Year for disk and disk subsystems is a thrilling affirmation that, not only has 3PAR delivered another incredible product in terms of innovation, performance, ease of use, and feature set, but that the F400 confers incredible value precisely when and where it is most needed." 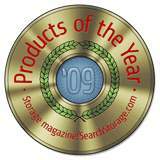 The 3PAR InServ F400 Storage Server is featured online at SearchStorage.com as part of the 2009 Products of the Year award results announcement. TechTarget's SearchStorage.com is the number-one online destination for IT professionals charged with purchasing, implementing, and managing storage systems at the core of large- and medium-sized businesses. More than 600,000 storage-focused IT executives, managers, and staff rely on SearchStorage.com for the information they need to do their jobs. SearchStorage.com content includes original editorial features, news, expert storage advice, Webcasts, and white papers. TechTarget's Storage Magazine is the only monthly resource that provides information technology (IT) executives, managers, and staff with in-depth analysis and forward-looking guidance on managing, storing, networking, and safeguarding the data at the core of large organizations. More information can be found at www.SearchStorage.com. 3PAR® (NYSE: PAR) is the leading global provider of utility storage, a category of highly virtualized and dynamically tiered storage arrays built for public and private cloud computing. Our virtualized storage platform was built from the ground up to be agile and efficient to address the limitations of traditional storage arrays for utility infrastructures. As a pioneer of thin provisioning and other storage virtualization technologies, we design our products to reduce power consumption to help companies meet their green computing initiatives, and to cut storage total cost of ownership. 3PAR customers have used our self-managing, efficient, and adaptable utility storage systems to reduce administration time and provisioning complexity, to improve server and storage utilization, and to scale and adapt flexibly in response to continuous growth and changing business needs. For more information, visit the 3PAR website at: www.3PAR.com. © 2010 3PAR Inc. All rights reserved. 3PAR, the 3PAR logo, Serving Information, InServ, InForm, InSpire, and Thin Built In are all trademarks or registered trademarks of 3PAR Inc. All other trademarks and registered trademarks are the property of their respective owners.